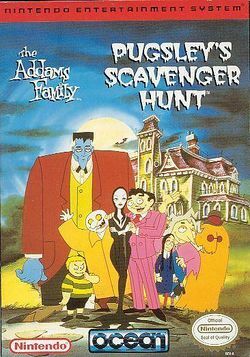 The Addams Family: Pugsley's Scavenger Hunt is a platform game developed and published by Ocean for the NES, SNES, and Game Boy in 1993. The Game Boy version was ported by Enigma Variations. The game is a side scrolling platformer adventure game that plays in a very similar way to the previous Addams Family title. The game plays in a non-linear way in so much that the player can choose which level to attempt by entering whichever door they choose in the Addams house. This page was last edited on 5 April 2016, at 06:14.